The pain – make it stop! People generally don’t come to see us because they’re feeling great. So why DO people come to visit us? Pain. Neck pain. Back pain. Accident injuries. Sports injuries. And SO many more reasons that you probably would never even think of! There are lots of medical ailments that involve the joints in the body can be helped by a chiropractor manipulating the person, mobilizing them or both. Range of motion problems can affect the arms, legs, spine, neck, shoulders, and other areas. This usually means there are several problems with the joints and muscles and ligaments around them. Manipulation is used to provide restoration of movement by mechanically loosening stiff muscles and joints. Joints like this are usually in a locked position or they’re joined to another body part. The chiropractor will mobilize the patient by stretching the tissues surrounding the joint in question. However, with spinal joints the chiropractic manipulation can be more effective with pain relief and restoration of normal movement. Less than 30 minutes from the center of Raleigh, Preston Chiropractic & Acupuncture has assisted the people of the “City of Oaks” for over a decade with their Raleigh chiropractic and Raleigh acupuncture needs. Often times, the joints of the spinal vertebra get misaligned and affect surrounding nerves and muscles. 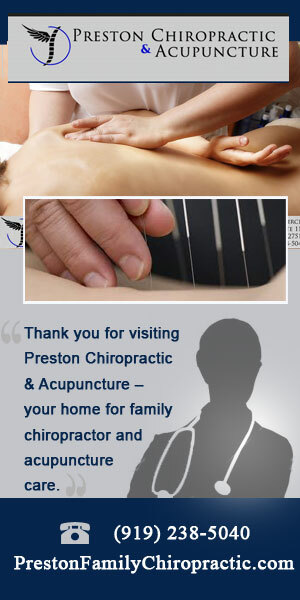 A chiropractor knows how to eliminate the pain quickly by giving a spinal adjustment or manipulation. Adults and children alike have been successfully treated for conditions involving upper respiratory infections, neck and muscle pain, and even acute earaches. At Preston Chiropractic and Acupuncture, we are family-friendly – so feel free to bring all members of your family for a visit! These are just a few of the services we offer. For any of your Raleigh chiropractic needs,give our offices a call. We have some of the best chiropractors in Raleigh and surrounding areas. Distance should not be an option when it comes to health. Whether you were involved in an auto accident or are working hard at your cubicle, we are dedicated to help you advance in life with great posture.